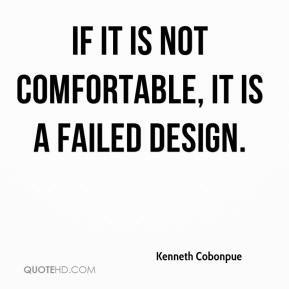 If it is not comfortable, it is a failed design. The long, hot summers just aren't too comfortable for tigers that are predisposed to like cooler climates. I'm obviously comfortable with my feminine side! I didn't have any reservations playing a gay guy as it was kind of a neat idea to me. I'm able to drop all the crappy male stuff of trying to impress the girl and get her into bed, because she thinks I'm gay. 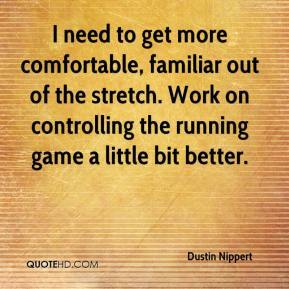 I need to get more comfortable, familiar out of the stretch. Work on controlling the running game a little bit better. 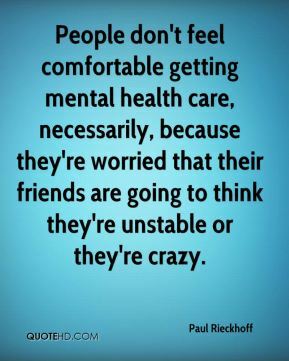 People don't feel comfortable getting mental health care, necessarily, because they're worried that their friends are going to think they're unstable or they're crazy. God has blessed this church in such a great way. 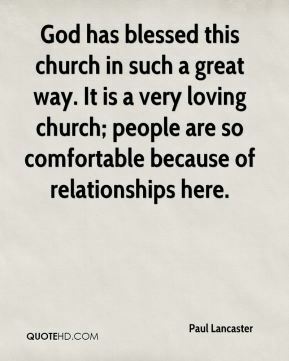 It is a very loving church; people are so comfortable because of relationships here. 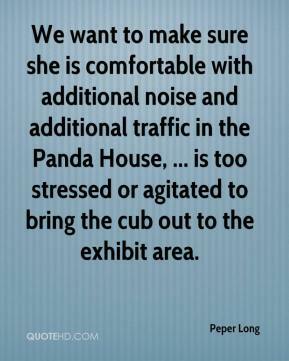 We want to make sure she is comfortable with additional noise and additional traffic in the Panda House, ... is too stressed or agitated to bring the cub out to the exhibit area. I didn't really feel comfortable, especially after the first interception. I really felt I got into a little slump. The coaches don't want to see that in me. They feel like I'm a battle-back type of guy. I'm still learning. It was only my 10th start. I've still got a long ways to go. 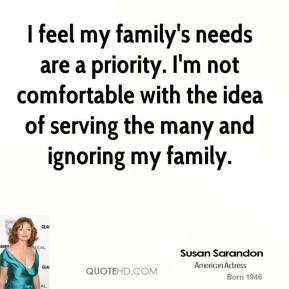 I feel very comfortable about it. ... I don't think there's any issue at all. 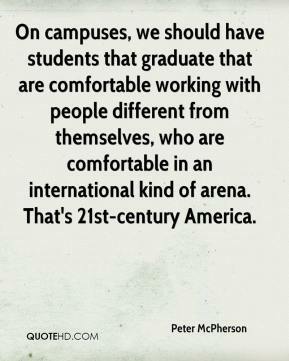 On campuses, we should have students that graduate that are comfortable working with people different from themselves, who are comfortable in an international kind of arena. 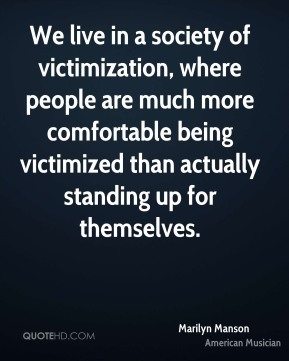 That's 21st-century America. I would characterize the meeting as very cordial, very comfortable, ... It (the exchange) was rather free-wheeling, without reading from notes. 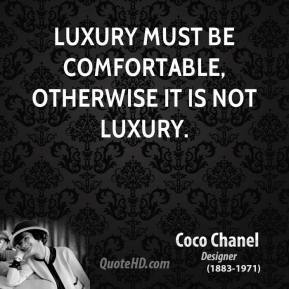 It was incredibly comfortable. 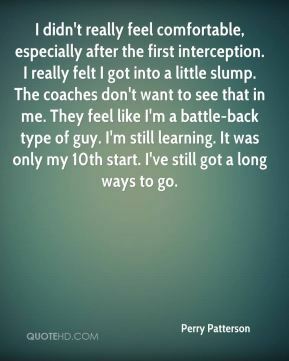 He feels very comfortable in our offense. He was our quarterback last year. He understands the system and knows what his teammates can do. 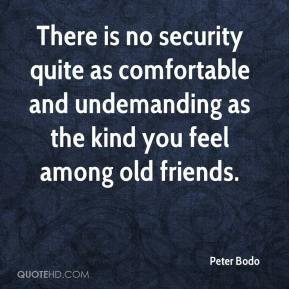 There is no security quite as comfortable and undemanding as the kind you feel among old friends. 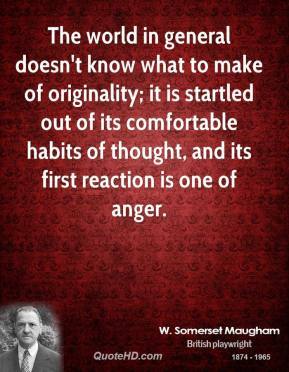 My character's torn between what's familiar and comfortable and what's new and exciting. 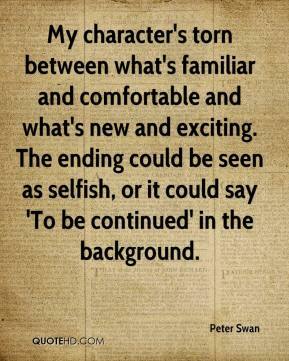 The ending could be seen as selfish, or it could say 'To be continued' in the background. It's at the point now where I'm just starting to get more comfortable. 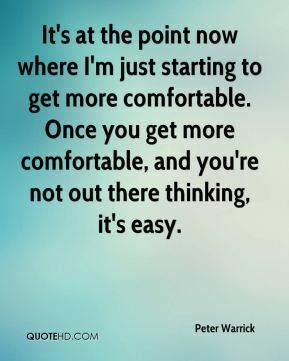 Once you get more comfortable, and you're not out there thinking, it's easy. I felt comfortable in the second half. It's a learning process and learning each other's game. 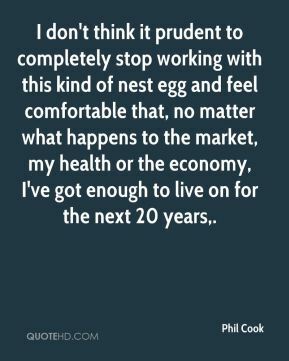 I don't think it prudent to completely stop working with this kind of nest egg and feel comfortable that, no matter what happens to the market, my health or the economy, I've got enough to live on for the next 20 years. 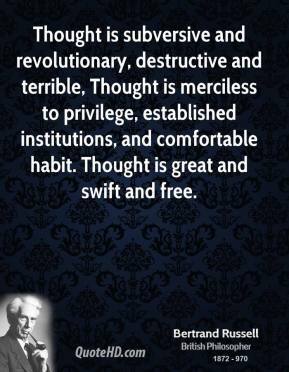 I feel like I'm getting better, I really do, ... 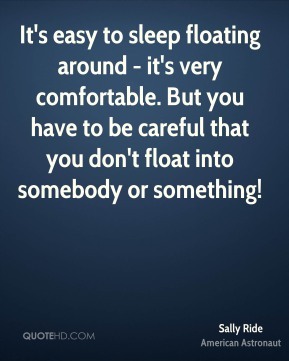 I do feel a lot more comfortable in there. 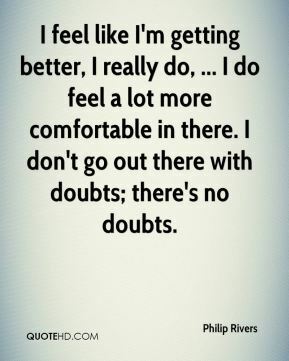 I don't go out there with doubts; there's no doubts.